The Gingerbread Man Loose in the School. By Laura Murray. Illustrated by Mike Lowery. Putnam, 2011. Interest level: K-2. Why did I re-read it? I would have created my back-to-school display much faster if I had not stopped to re-read almost every picture book I placed on the table, but it is nearly impossible not to take a peek inside your favorite picture books. It feels as though you’re reconnecting with long lost friends. When will I recommend it? A Kindergarten Teacher: "Can you recommend a read-aloud for the fourth day of school?" A First-Grade Teacher: "I want to create a scavenger hunt that requires my students to visit different rooms around the school." -I would give the teacher a copy of this activity guide. Creepy Carrots. By Aaron Reynolds. Illustrated by Peter Brown. Simon & Schuster, 2012. Interest level: K-3. Ummm....did you catch who created this creepy picture book? Aaron Reynolds + Peter Brown = a dream team. A 2nd Grader: "Mr. Schu, do you remember when Mr. Peter Brown visited our school library? Does he have a new book?" A 3rd Grader: "Do you have any picture books that remind you of The Twilight Zone? I watched an episode during summer break." A 27th Grader (That's not a typo. ): "John, what's one of the best picture books you have read during 2012?" Rifles for Watie. By Harold Keith. HarperTeen, 1957. Interest level: Grades 6-8. 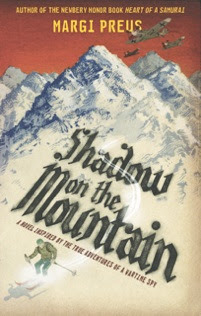 It won the 1958 Newbery Medal. An email from someone interested in the Newbery Challenge: "Which Newbery Medal-winning book has the world's smallest type size?" The Creepy Carrots book--I must order this for out library! I can already think of about 25 kids who will want this one in their backpacks. I did a teacher's guide for Laura for her picture book The Gingerbread Man Loose in the School, and our students love that book. She's got a sequel coming soon called The Gingerbread Man Loose in the Firehouse that I'll have to order, as well. I enjoyed that you told through recommendations about the 2 picture books-they look fun. The Newbery challenge sounds like just that-a challenge. Carry on! Totally cracking up about to whom you'd recommend Rifles to Watie . . .
Have a great week with your students! 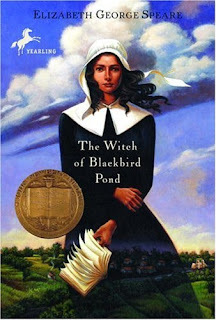 I have a copy of The Witch of Blackbird Pond and have been wanting to read it for awhile. I'll be interested to find out if you like it! :) Or if you recommend it because it has a "W" in the title. LOL! Gosh, I've heard of The Witch of Blackbird Pond but have never read it...you might be getting to where I'll be able to join in!